I admit it: I’m often way too busy to attend the various board, commission, and committee meetings that take place as the gears of our local government grind away. If nobody attends, though, those gears threaten to grind away at our liberty. Who then do we blame? I’ve come to the conclusion that we have the government we deserve. 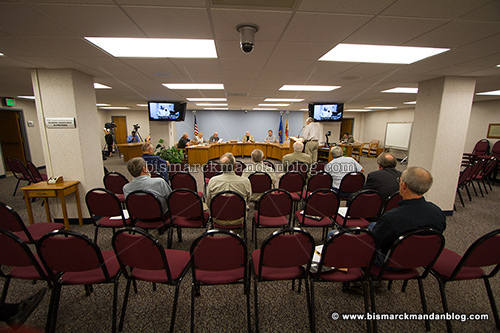 Case in point: last night’s Burleigh County Commission meeting on adopting a Home Rule Charter. I tentatively agree that we need a new jail, although I’m intrigued by others’ opinions that many are jailed unnecessarily while awaiting trial or detox and that rehabilitation of convicted criminals here is not proportional to incarceration. As we plod ahead toward building a costly new correctional facility, the best way to do it is with a home rule charter and temporary sales tax (yeah, I know). A group of people are going about the process of designing that charter, and a meeting last night was held for public information and comment. The room was nearly empty. When sales taxes in Burleigh County increase by a half percent, will you notice? If so, will you be upset? If you’re upset, do you know why? If you know why, is it because you disagree with the idea of funding the jail with sales tax instead of property tax? Unless the answer to ALL of the above questions is YES, please do us a favor and shut up…unless you’ve actually attended any of these meetings and given your input. By the way, despite hundreds of millions of dollars of ill-conceived “shell game” property tax buy-downs by the state legislature, last night the Commission voted to raise your taxes again. I had to leave before that portion of the meeting, unfortunately, but I did watch the feed live online. You can do so on the Dakota Media Access website. I know we’re all busy…heck, I rarely find time to get to one of these meetings. I do, however, try to stay on top of issues that are important to me and make arrangements to attend those. When I do, I try to arrive with a well informed and thoroughly pondered opinion and a willingness to walk to the podium and make it known if I think it will contribute to the discussion. I wish I could make them all, but we’re understandably busy. Busy or not, these commissions meet and make decisions that affect your daily life, your liberty, your property, and your prosperity. “I was busy” is of little consolation when you find yourself on the wrong end of some board’s policy decision…so stay informed, get involved when you can, and let’s hold our local government accountable. I agree, I do watch the meetings on TV but wouldn’t it be nice if they would setup a system where they could e-mail you the meeting schedules? Of course they don’t want us there so wouldn’t do that but there WOULD be more. I don’t get the paper, am I suppose to magically know? Agree 100%, like school board meetings that no one attends but parents complain constantly about the education system. Kathleen – have you been to school board meetings in the last couple years? With all the Common Core debate going on, those meetings have been fairly well attended by the very people who have “complaining” and working tirelessly to do something about it.